Per Mertesacker had only received one card all season (a yellow) up until Sunday when he got a straight red for an ill-conceived tackle on the premier league’s prime pantomime villain. That’s the thing about playing Chelsea, it always seems to go wrong for Arsenal, no matter what the form tables say we find a way to implode and throw it all away. Arsenal have received five red cards in our last four games against Chelsea. Per’s 17th minute dismissal came with a sinking feeling coupled with an alarming sensation of resigned familiarity, and begs the question as to whether we will ever shake this demon. At least this time it was against a manager that actually resembles something like a decent human being. As the game approached, I felt confidence in our ability to break the trend grow with every day. Ozil was a lock, Sanchez was reported to be in good shape, and even Coquelin was a regular feature in the squad training photos. There was a lot to feel positive about. It seemed that in the last two games the burden of injuries had finally caught up to us and reinforcements we greatly needed, it seemed they were on the way. I truly believe that had this game remained even, in terms of players, we would have won and comfortably. But once again, our inability to maintain composure cost us dearly. Per cannot take all the blame, a complete absence of control in the mid-field allowed the killer pass to be played and an error in judgement from the big guy led to the dismissal. 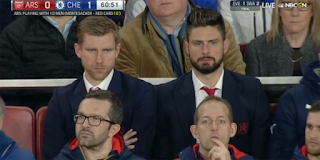 Then followed outrage from the fans as Giroud was sacrificed to bring on a replacement centre back. The boss is often criticised for not being ruthless enough, but seems that whenever he is he is criticised for that too. He made a purely tactical decision that, if we had not conceded so soon after, would have probably resulted in us getting a hard earned point when all seemed lost. I was more worried from a defensive standpoint that bringing off Giroud would leave us literally short for defending set pieces. As it turned out, Chelsea decided not to test us in this manor taking a series of short corners throughout the game, and the goal we did concede would not have been negated by the presence of Giroud. There was no point in the game that I could obviously tell we were playing with 10 men and I think that was a result of the shape, tactics and personnel the boss used throughout the game. Now it is time to pull our socks up and get back into form. It will not be easy. Burnley just thrashed Derby at the top of the Championship and will be no pushovers - that is for sure. We will need to fight hard and there will most certainly be a fair amount of squad rotation. A win here will lift us and it is then imperative that we dispatch of the south coast contingent. The boss has shown he can be ruthless, we saw that in the sad face of the fully suited French striker sitting in the stands after the first half. Now it is time for the team to show the same and take Soton and Brighton to the cleaners.